Google's new, unified Hangouts platform focuses heavily on its mobile apps, which give Android and iOS users a common platform for text and video chats. In theory, they're the cure for the consistency problems Google's messaging systems have faced for years. But are they the fixes we've all been waiting for, the all-encompassing solutions that have us dropping the likes of Facebook Messenger or WhatsApp? We gave Hangouts a test on both Android and iOS to find out -- check our impressions after the break. 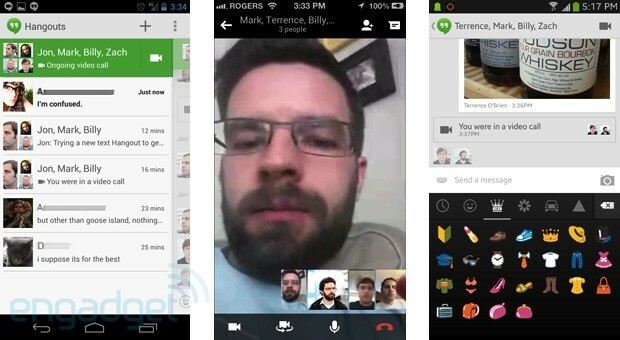 Getting set up with either Hangouts app is certainly easy. It just requires a quick sign-in on iOS, and it's virtually automatic on Android if you've used Google Talk (which Hangouts replaces) in the past. Most settings, such as notification options, are also in familiar places on Android. Notification snoozing is new: you can now tell the app not to bug you for a set period, such as when you're at work or the bar. Google's approach to managing its newly persistent chat history is potentially confusing, though. Rather than implement a global control, Google manages policy changes on a chat-by-chat basis. If you don't want to ever have a permanent (if private) record of what you've said, you'll have to make that choice every time. Google tells us that chats will disappear after 24 hours when the history is turned off. It's when you get down to business that the changes are truly conspicuous. Google said it was structuring Hangouts around conversations, and it wasn't kidding: the view on starting the mobile app usually involves active and recent text and video sessions, rather than a list of chat candidates. Contacts are there, but you'll have to start a new Hangout or invite new participants to see them. It's more of a calculated trade-off than a uniformly positive improvement, in our view. While a conversations-first approach is handy for resuming any earlier activity, it's a bit counter-intuitive when you just want to see if a friend is available. We had no problems starting chats, however, and it's clear that Google spent a lot of time livening up the slightly boring Google Talk interface. It now behaves more like other recent messaging apps, with appealing uses of chat bubbles and emoji. Photos are new, and (mostly) work seamlessly -- hitting the relevant button brings up your device's default photo picker, and any image dropped into the chat should remain visible when switching devices. We do wish that audio and video were options. 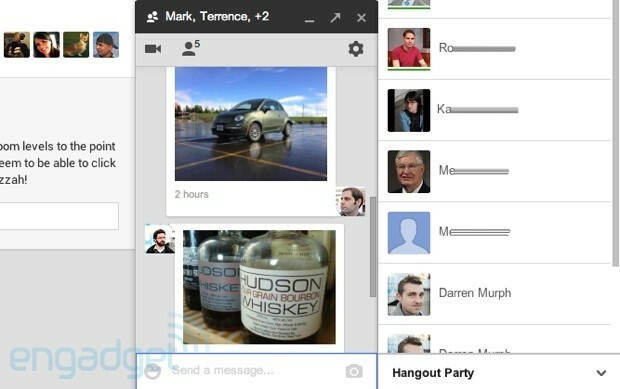 Group video Hangouts are billed as new, although our experience showed that to be something of a misnomer. The minimalist interface will be familiar to those who've used Google's previous video-capable mobile apps. One nice touch in the new release is the slick integration with related chats. It's easy to tell if someone just posted a photo while you're in a video Hangout, and it's simple to rejoin that same session when it's in progress. Don't try to connect to a chat directly through AT&T (and possibly other carriers), though: at first blush, it appears that AT&T may be blocking Hangouts over its cellular network. Cross-platform, the interaction and persistence were largely as good as we'd hoped. While we couldn't try Gmail integration on the desktop (we weren't getting the option), our Android and iOS testers could freely participate in conversations without feeling hamstrung, and completed Hangouts would reliably appear on other devices or the web. As many of us have multi-device households, we also have an extra level of appreciation for the smarter attitude towards notifications. Clear one alert on a device and you won't always have to deal with it on everything else you own, where OS features allow -- you'll still see an iOS notice on Android (or vice versa), but multiple Android devices and the web handle notifications elegantly. The Google+ web redesign (which could be a hands-on by itself) makes it a lot easier both to review mobile discussions and to see their related photos in one central location. Each session's photos are saved to a private album. Our early takeaway? If you're a Google+ fan, use at least one of Google messaging services or just want to give Google's services a shot, the Hangouts apps are welcome additions. They're simple to use, keep conversations going across platforms and consolidate multiple once-disparate services into one framework. The question is harder to answer for anyone wedded to another cross-platform messaging system. Facebook Messenger and WhatsApp already take on text chat and photo sharing while occasionally doing more, such as audio clips or locations. Google also hasn't dethroned Skype for live video, and can't do voice alone in the current Hangouts version. These rivals have some momentum on their side, too; it's hard to ignore a billion-plus Facebook users, while Google+ is comparatively young. The appeal for the unconverted may come mostly from Google's sheer reach. When Hangouts offers both text and video chat, and serves them equally through mobile apps and the web, it may be the one service that's always on hand.